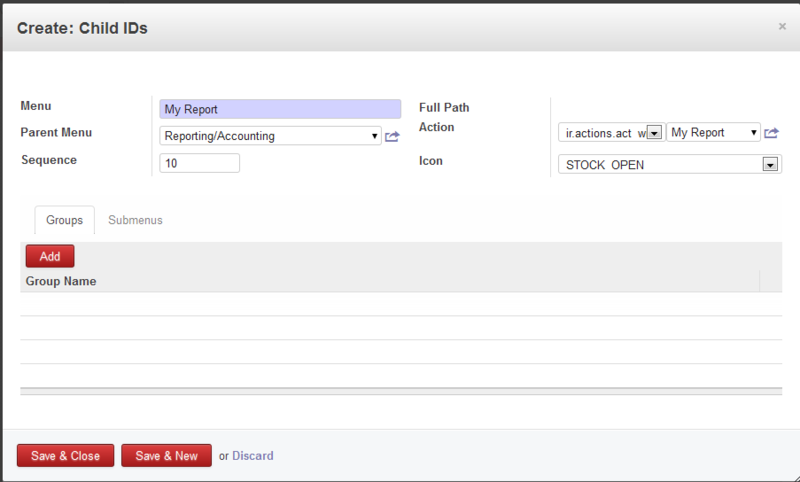 OpenERP allows creating different reports easily using their interface. If you want to use SQL queries to work as back-end of your report and show it like other built in reports under a menu, here is how you can do. In our example we are going to create a new module My Report which will have the model we are going to use for creating the report. In the module folder create a file my_report.py. In the file we are going to define our model my_report_model. In this model we have defined the fields we are going to use in the report. In the init() method we have defined the SQL View which we are going to use for the report. The view name should match the class name defined in _name attribute (replace dot with underscore). Also the view columns should match the columns defined in _columns attribute. Save the model and install the newly created module. The my.report.model object will now be available. Go to Settings > Technical > User Interface > Views. Enter my.report.tree.view as View Name (you may use name of your choice). Enter the name of the model (declared in the model using _name attribute) in Object field. Enter the XML for the tree view in Architecture field. Go to Settings > Technical > Actions > Window Actions. Give an Action Name, in our case My Report. In Object field enter the model name, same as name we entered in the tree view. In View Mode field enter tree, form if you want to show both tree and form view. If you don’t want to allow the user to edit the entry the use only tree. In our case we have used tree. From the View Ref. dropdown select the tree view we have created earlier. Go to Settings > Technical > User Interface > Menu Items. Enter Name of the menu item, in our case it is My Report. We have selected Reporting/Accounting as the Parent Menu. 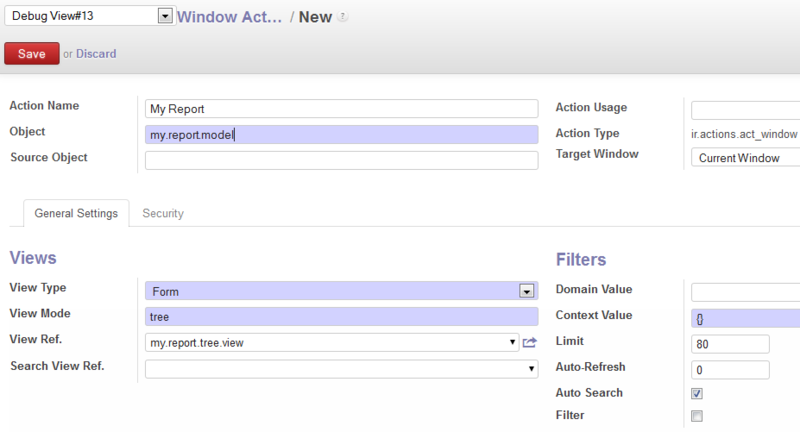 From the Action dropdown we have selected ir.actions.act_window and then the selected the Window Action we have created earlier. Refresh the window and the new menu item will be available under Reporting > Accounting menu. Go to the Window Action we have created. Click on the Search View Ref. dropdown and click on Create and Edit… link. The new View form will be opened. The Search View Ref. field requires a view of type Search. Don’t worry if the new View form shows View Type as Tree. It will change on save. Give a name like my.report.search.view. Enter the class name we have created in Object field. Enter the XML in Architecture field as follows with the fields to be searched on by default. Save the view and then save the Window Action. Now if you type anything in the search box, options will be given to search in fields you have entered in Search view. Hope this will give you an idea on how we may add a report backed by SQL queries. If you have any other ideas/suggestions then share with us. You may create PDF reports with the help of Openoffice Report Designer plugin. This post may give you an idea – http://www.zbeanztech.com/blog/openerp-openoffice-report-designer. An error has occurred during validation / the field (s) res_model, src_model: not valid in the Model definition of the action. Please check if the fields you have used in the views exists in the model or not. I do the same with example, but the tree view can not display correctly. For example I use PostgreSql Maestro to execute the query, I have 600 records. But the tree view only show 2 records. Check the Limit field’s value in the window action. Share more details about what you have done. Thanks for answer for my problem. In the tree view, It show the number of record, when I click to it, I can select the number of record (ex: 80, 200,500,2000,unlimited). When i choose unlimited, It can not show anymore. About limit field’s value in the windows action: it is default (80). I don’t see anything wrong with the code. Can you please check after removing the GROUP BY clause from the query? Another important thing if you make any change to the query, run the CREATE OR REPLACE statement in the database or uninstall/install the module to reflect the change to database. Ok. Thanks. I’ve fixed this error. I am wrong with “nrprt.id as id”. I change “nrprt.id as id” with “nr.id as id”, it’s OK.
I’ve new problem. The problem is:There is not argument to pass value to sql query. If I have to pass value to where clause, how can i do it? Please help me? I have a problem with this solution. HINT: Use DROP TABLE to remove a table. And a table with name “immobiliare_richiesteofferte” is created into DB by this code. Why OpenERP create a table when is a view ? The “_model” in the name is a special key ? Yes you are right. You will have to set the _auto property to False in your model. OpenERP maps a model with a table with the same name and it creates the table when installing the module. If _auto is set to False then it does not create corresponding table. So, make sure you have the _auto variable set to False in your model. Now I get “OpenERP client Error: Uncaught SyntaxError: Unexpected token F” when click on menu item that open the view. I validate the xml of the view and the action bat the view not open and get the error. It is very hard to tell where the problem is without seeing your implementation. You may check the XMLs again to see if ‘F’ has been entered anywhere mistakenly, may be in tags. Great !!! It’s work !!! I use a view to make a join beetwin request and offers in real estate management system. Betel: in mine view I’had specify the wrog model to the view. We have an assignment on OpenERP and we are new to it. Where to save the model and how install the newly created module? hello sanybody will you please explain me how to use our own formulas and expression in openerp report designer to customize existing module reports………..i know how to customize reports in libreoffice but not getting how to use our own formulas to make changes…??? Betel: The unexpected (OpenERP client Error: Uncaught SyntaxError: Unexpected token F”) is because of the capital F in the view. create=”False” should be replaced with create=”false”. In view mode we can select both tree and form. 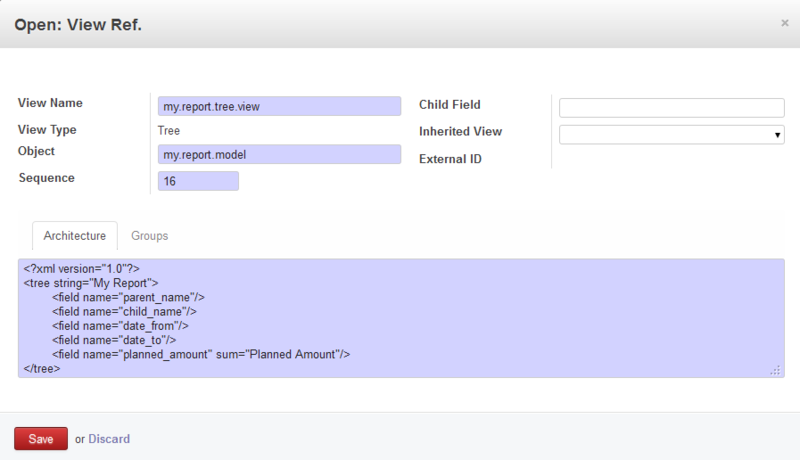 But cannot visible the form view of the model..pls reply…. Sorry, did not understand your question. Can you please tell in details? ‘sge_report_model’ is the custom model I’ve created based on a SQL query (SQL View). It has two columns (), but no ‘id’ and that’s apparently where the error comes from. Below you can find the python code for my module (sge_report.py). Why do I need an ‘id’ field in my model and is there a way to generate it automatically? Thank you so much for the example. Could I suggest you make correction from False to false in Create View so that the “F” issue will no longer an issue. Great article Mohammad. I was able to create a few reports but what I was not able to get working is the export feature. When y select a few rows and clic on More->Export there are no columns available to select. I tried a few things (I think it has something to do with the fields_get or get_fields function in the model) but I were not able to get it working since I don’t have much expertise with python. Do you know if it is easy to add the export feature to this kind of reports? And on another topic, it would also be great if you know how to support “Group by” on the report (different grouping available on search menu). Great post, thank you. I got it working but the list doesn’t allow ordering. I click and does nothing. So, with min(c.id) we have the solution, the report works. Thanks Mohammad Sajjad Hossain For your blog, it helped me ! The XML sections in the article can not be read. Please help. The post has been updated with the missing XML sections. 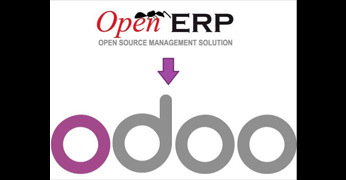 Hello I am Maxime AKEBOUE I am a novice in odoo. I want to export serial number, Students Names, Father Names, Mobile Numbers, Emails, Course, Batch, invoice total, amounts paid with dates, due amount, etc. Any help plz? i am sorry its 2018 but im developing in openerp in the pass 6 months now… i have a problem i want to print a report but before printing it i want to check two fields if the match then print just to retrieve the correct report ( not sure if i have to do a SELECTquery and use that or just give a IF statement ) PLEASE HELP Mohammad.